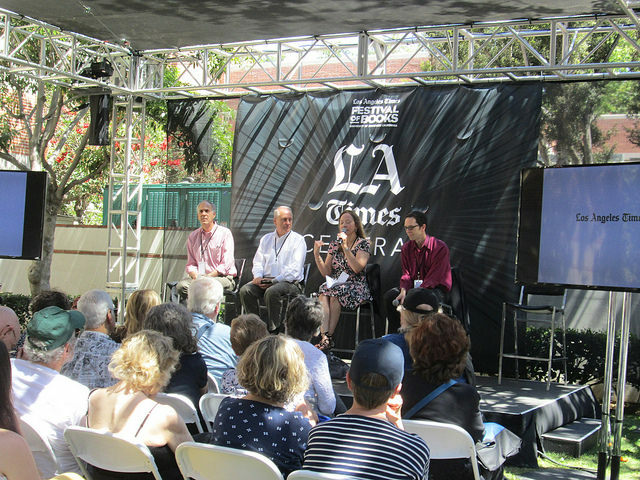 For the first time since the event moved from UCLA to the University of Southern California campus, I attended both days of the Los Angeles Times Festival of Books. It was exhilarating to see so many people in one place who were united by the simple fact that they liked to read. Also, many of the attendees brought their children along because they wanted them to read as well. Based on what was on offer, many of the books were not to my taste. I did buy titles by Jeddu Krishnamurti, Gabriel García Marquez, Magda Szabo (a fellow Magyar), Gwen Katz, and Dorothy B. Hughes; and I will probably read all five within the next couple of months. On Saturday, I attended two panels by Times reporters, one on world travel and one on homelessness. Because the seat next to me was vacant at both panels (was it my deodorant? ), I found myself answering the inevitable question as to whether I was saving the empty seat with something obscene in Hungarian. Most of the time, I was in remarkably good temper. I didn’t like buying my lunch from food trucks, as there is a certain mediocrity built into the delivery medium. Three of the best remaining bookstores in L.A. were represented with interesting selections: Vroman’s Bookstore from Pasadena, Book Soup from the Sunset Strip, and Kinokuniya from Little Tokyo. 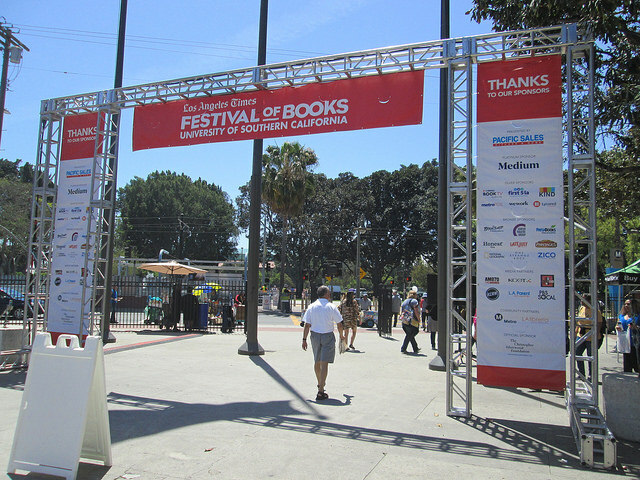 There were a lot of booths manned by authors who were using the Festival to push their books. I felt a little sorry for them, but I can understand how they felt, dishing out so much cash for so little return. (I make one exception: Gwen Katz, who was recommended along with her book by my friend Bill Korn). It’s great that the MetroRail Expo Line is now fully operational, as I would much rather pay $1.20 for public transportation than $12.00 for parking in a distant structure. I am already looking forward to next year’s Festival.